The booming medical tourism industry in Malaysia accounts for a high degree of competition among players in the market, says a new market study by Transparency Market Research (TMR). As the market is heading towards maturity, a number of key players are engaged in introducing differentiator products and services to report sustainable growth. Despite being highly competitive, the medical tourism market in Malaysia is largely consolidated with leading players holding dominant share in the market. Some of the key companies in the Malaysia medical tourism market are Prince Court Medical Center, Sunway Medical Center, KPJ Healthcare Berhad, IJN Health Institute, and Island Hospital. These institutions are engaged in expanding their geographical footprint and expanding their foreign customer base to strengthen their position in the Malaysia medical tourism market. According to the report, the Malaysia medical tourism market is expected to reach a valuation of US$3.5 bn from US$424.96 mn between 2016 and 2024. This will translate into a whopping CAGR of 30.05% between 2016 and 2024. In 2016 dentistry stood as the leading market segment with 36.6% of medical tourists availing dental treatments. Besides this, aesthetic/ cosmetic surgery procedures and health screening services also displayed a considerably high demand among medical tourists. Inexpensive medical services as compared to that offered in developed countries of North America and Europe is the major factor attracting medical tourists to Malaysia. Moreover, persistent efforts from the Malaysian government to promote medical tourism will bode well for the Malaysia medical tourism industry. 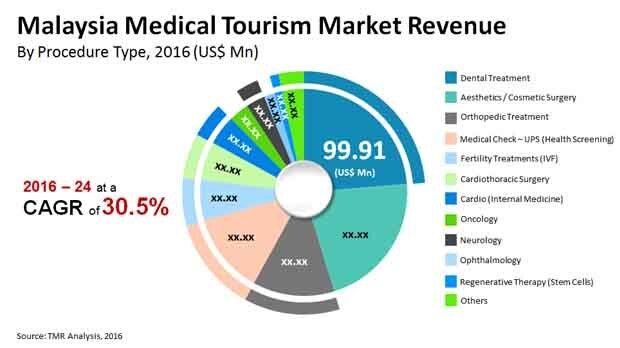 These factors along with the increasing influx of medical tourists from neighboring countries and MENA with poor healthcare services is poised to translate into exponential growth for the Malaysia medical tourism market. The accelerated growth of the medical tourism industry in Malaysia is attributed to exceptional macro-economic factors such as governmental initiatives for promoting medical tourism, first-rate transportation facilities, and satisfactory recuperation facilities. For example, to promote medical tourism, the Malaysian government offers tax rebates, especially on revenue generated from medical tourists visiting from foreign lands. “In 2009, the government offered tax rebate of 50% on revenues generated from treatment of foreign patients, which was further increased to 100% by 2010,” says a TMR analyst. In Malaysia, medical tourism accounts as one of the 12 national key economic areas, which is a chief factor driving the market. On the flip side, medical inflation registered in 2015 and a small drop in number of medical tourists could be detrimental to the market’s growth. Besides this, the growth of the market is challenged from low revenue generation per patient, mounting healthcare costs, and escalating burden on Malaysia’s healthcare system. Regardless of these factors, Malaysia is a preferred destination among medical tourists, which will bode well for the country’s medical tourism market. The review presented is based on findings of Transparency Market Research report, titled “Medical Tourism Market (Procedure Type - Cardio Internal Medicine (Angiogram, ASD closure, Pacemakers, Watchmen device implants, Angioplasty, Atherectomy, Radiofrequency ablation, Cardio consultation), Cardiothoracic Surgery (Heart Valve Replacement, Heart transplant, Cardiothoracic consultation, Coronary artery bypass, Stenting), Oncology (Bone Marrow Transpalnt, Oncology consultation), Fertility Treatments (Embryo Transplants, Fertility treatments consultation), Orthopedic Treatment (Arthroplasty, Fracture repair, Internal fixations, Physiotherapy, Arthroscopy, Hip replacement, Knee replacement, Orthopedic consultation), Dental Treatment (Dental Implants, dental treatment consultation), Ophthalmology (Corneal Transplants, Ophthalmology consultation), Aesthetics/Cosmetic Surgery (Hair Transplants, Rhinoplasty, Lipsuction, Aesthetics/Cosmetic consultation, Breast Augmentation Procedures, Face Lift, Tummy Tuck), Neurology (Brain Surgery, Neurology consultation), Regenerative Therapy (Stem Cell Transplant, Regenerative Therapy), Medical Check-Ups, and Kidney and Liver Transplants) - Malaysia Industry Analysis, Size, Share, Growth, Trends, and Forecast 2016 - 2024"